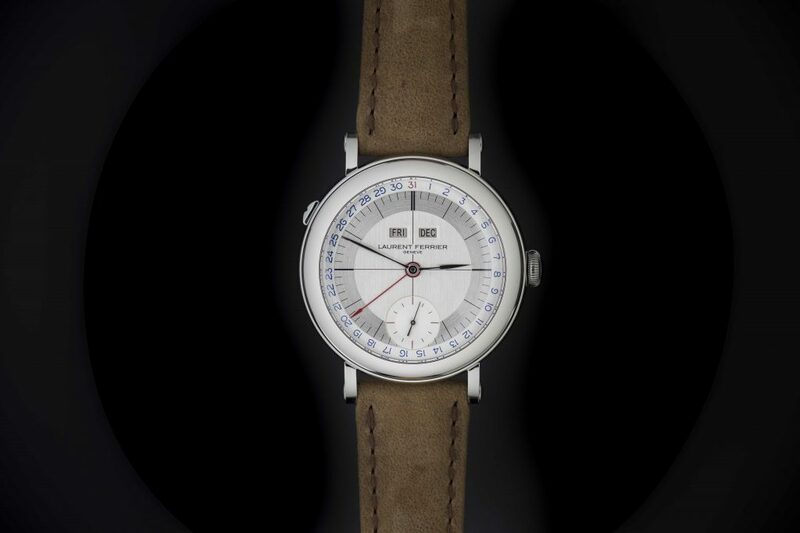 For 2018 SIHH Laurent Ferrier is releasing the 5th exclusive in-house caliber — with annual calendar complication, The Galet Annual Calendar School Piece. The vintage-inspired piece is packed to the brim with horological fire power sure to please. The Galet Annual Calendar School Piece is designed around delivering optimal visibility while delivering user friendly functionality. The date and month function are adjusted by winding the crown forward and backward. For the annual calendar complication, Laurent Ferrier is paying homage to its first manual winding movement: the tourbillon double hairspring. The new caliber features a long “blade” type click ratchet which became a distinctive signature. the movement in this watch is the Manual winding calibre LF126.01 with 235 parts. For the first time, Laurent Ferrier will introduce a “pale” 18K yellow gold version. The dial is finished in either slate grey or silver toned and sports vintage numerals painted blue and two zones with vertical satin brushed on the center and circular satin brushed on the outer circle. The case back of the Galet Annual Calendar School Piece features a power reserve indicator and a host of finishing details that speak to Laurent Ferrier’s prowess. A Côtes de Genève motif with a ruthenium treatment adorning the bridges and the circular-graining of the mainplate are on display. The sides and interior angles are manually chamfered and the screw heads are polished. The Galet Annual Calendar School Piece displays the date and months for those have 30 or 31 days. The only manual adjustment needed is on March 1st. 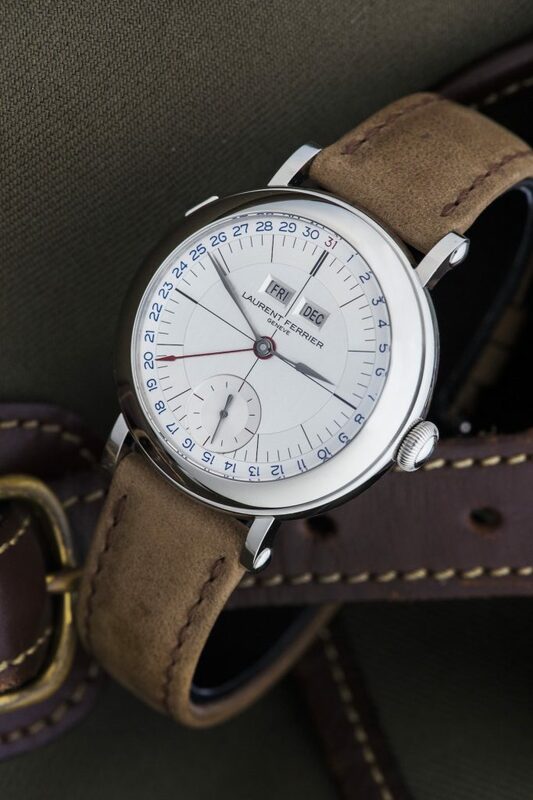 The date is displayed around the edge of the dial and a central red hand points the way. In beveled openings the day of the week and the month are detailed just beneath the 12 o’clock position. At the 6 o’clock a circular satin brushed outer circle and a snailed finish in the center hosts a small seconds indicator. Keeping user friendliness at the forefront, the day of the week is adjusted by pushing the ‘easy to grip’ button integrated into the left side of the case. The other adjustments, as stated earlier, are made via the crown. No tool is required to update the information displayed on the watch. A source of inspiration in designing the case is the pocket watch and with the development of the Galet Annual Calendar School Piece, Laurent Ferrier was able to adapt a 40mm case to capture the ascetics they desire. Two metal options are available, stainless steel and a two tone red and pale yellow gold. The piece is presented on either a brown alligator strap or beige calf leather. 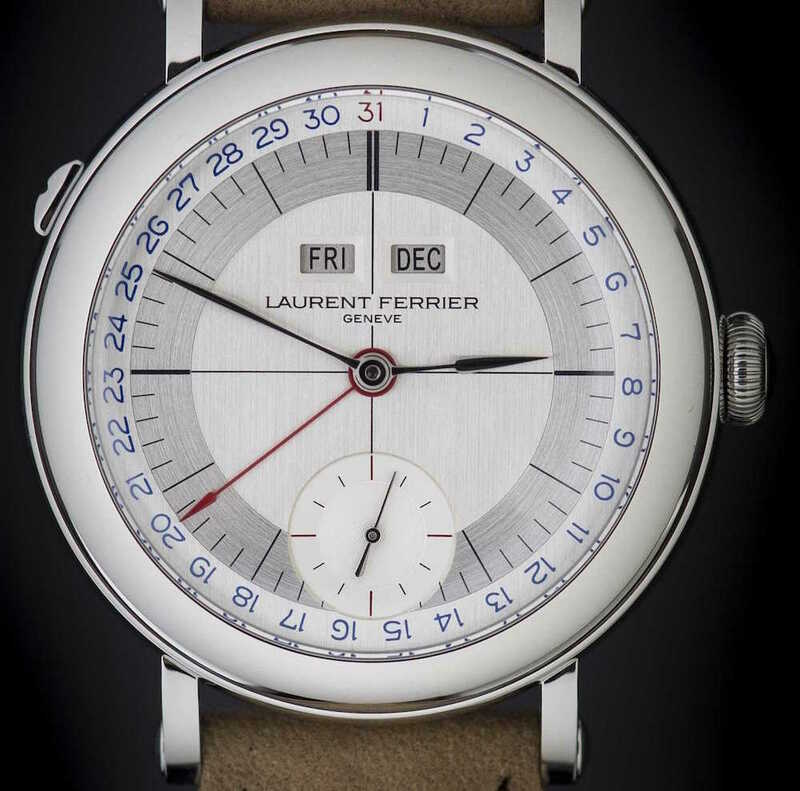 Laurent Ferrier Galet Annual Calendar School Piece has a vintage appeal thanks to the dial, color accents and strap. O ́clock for days of the week. • Correction forward / backward of the calendar on intermediate position. • Movement diameter: 31.60 mm (14 ́ ́ ́). 18K / 750 5N red gold, 18K / 750 pale yellow gold or stainless steel. Thickness: 10.10 mm or 12.80 mm including the sapphire crystal. Domed sapphire crystals, front and back. Silver-toned or slate-grey. Vintage-inspired numerals painted in blue. Vertical satin brushed on the center and circular satin brushed on the outer circle. Small second at 6 O ́clock, with circular satin brushed outer circle and snailed finish in the center. 18K / 750 210Pd white gold. Hours and minutes: “Assegai-shaped”. Painted in white or ruthenium treated. Seconds: baton-type with counterweight. Painted in white or ruthenium treated. Black alligator leather Alcantara lining. Pin buckle or a double blade folding clasp.